Rumors abound that Okami is gong to be re-released on PS3, complete with HD graphics and Move support. According to a leak published by Famitsu magazine, the updated version of the game will be called Okami Zekkei-Den (roughly: Okami: Magnificent Version. The PS3-exclusive title, which will apparently sport HD graphics and Move support, is due to go on sale on November 1st in Japan, and will cost 3990Y (around US $50). 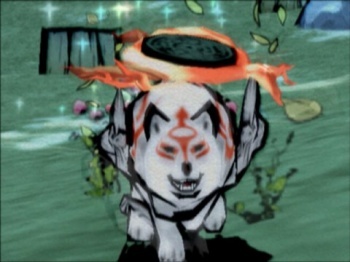 Like most titles from the now defunct developer, Clover Studio, the original PS2 release of Okami was a hit with critics but failed to make an impact on the sales charts, shifting only 280,000 copies. The Wii release, which had slightly improved graphics and motion control support, came close to breaking 600,000 units sold. Unfortunately, it was also the first victim of Capcom's box art gremlins. While the Move control schemes seems like a perfect fit for Okami's brush-based gameplay, I'm personally far more interested in seeing the game's gorgeous sumi-e inspired art style rendered in HD. Famitsu didn't name its source, nor provide any screenshots or other evidence of the port's existence, so we'll have to mark this one down as a (pleasant) rumor for now.